© MARIO VAZQUEZ/AFP/Getty Images View of a cable car station decorated with a mural of Icelandic artist Guido Van Helten at a poor neighborhood in Ecatepec, Mexico on August 25, 2016. 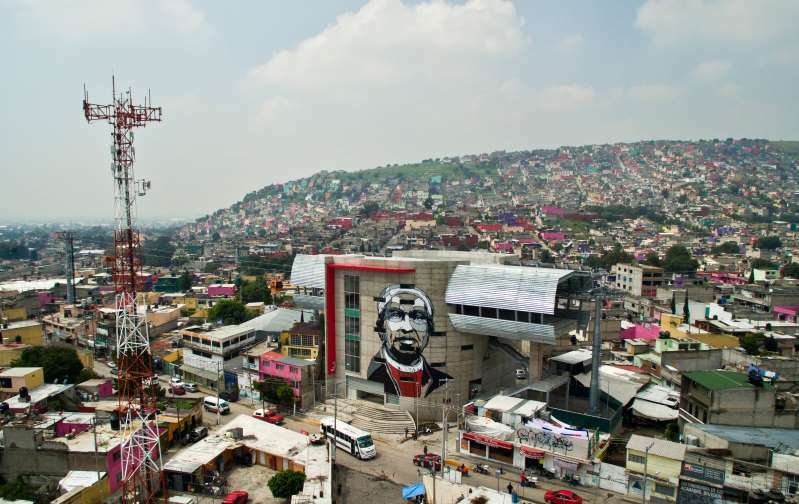 Dozens of murals were painted on buildings in a poor neighborhood in Ecatepec, on the route of a new cable car that will run this year. The arrests were announced Friday by Alejandro Gomez, attorney general of the State of Mexico, which borders the capital, Reuters reported. The man and the woman were arrested Thursday as they left a house in Ecatepec pushing a baby carriage. A search of the carriage turned up dismembered human body parts the pair intended to dispose of in a nearby vacant lot, police said. A search of the lot turned up more body parts. Police said the couple acknowledged disposing of other bodies in a similar fashion. They told police they sold one of the dead women’s 2-month-old baby girl to another couple, who were arrested. The baby was returned to her grandmother. Cops suspected the man and the woman because they knew three women who had disappeared over the last five months. Mexico State, which borders Mexico City to the east, north and west, has suffered from waves of women’s killings in recent years. While it is unclear how widespread trafficking of children is in Mexico, the Network for Children’s Rights in Mexico estimates that an average of four minors disappear every day in Mexico.